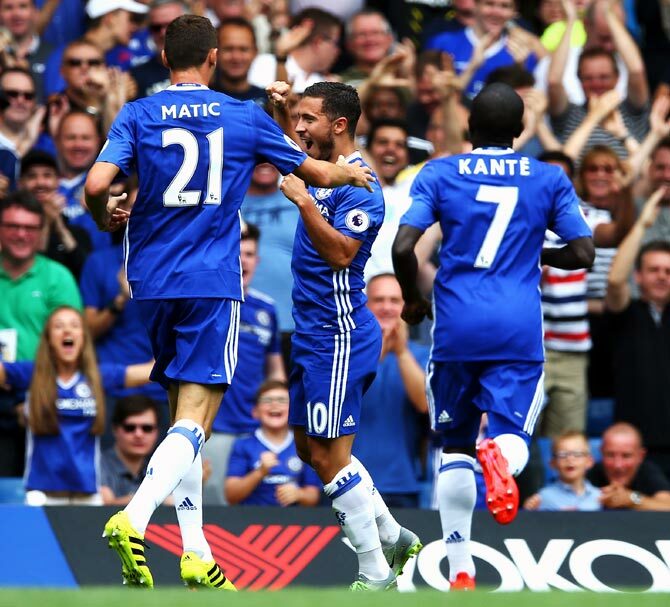 IMAGE: Eden Hazard, centre, celebrates with his team mates after scoring Chelsea's opening goal. Photograph: Steve Bardens/Getty Images. Goals from Eden Hazard, Willian and Victor Moses sent Antonio Conte's Chelsea to the top of the Premier League on Saturday with a 3-0 win over promoted Burnley in a one-sided match at Stamford Bridge. Belgian Hazard picked up the ball in his own half in the ninth minute and with a burst of speed wrong-footed defenders, cut inside Michael Keane and sent a right foot shot low past a diving keeper Tom Heaton. Willian's contribution came in the 41st minute after an exchange of passes between Hazard and Spain striker Diego Costa. Costa sent the ball to the Brazilian who sidestepped Stephen Ward and drilled the ball into the net. Heaton was called into action constantly in the second half as Chelsea peppered the Burnley goal with shots. But he could not keep out Moses, who got on the end of a ball from fellow-substitute Pedro in the dying minutes, ensuring a 100 percent start to the campaign for the London side. 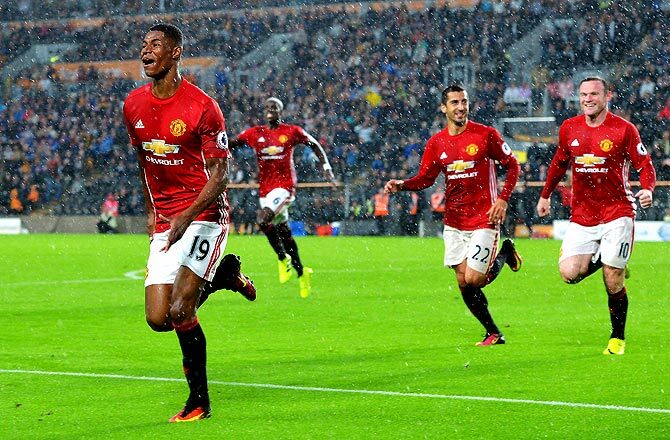 Marcus Rashford scored a stoppage-time winner as Manchester United broke Hull City's resistance at the death to win 1-0 at the KCOM Stadium on Saturday and keep Jose Mourinho's winning record alive at his new club. In wet conditions, United were laboured and their build-up play was slow as they struggled to break down their hosts, but Rashford provided a late spark after replacing Juan Mata, and converted Wayne Rooney's cross in the 92nd minute to crown a lively cameo. Both sides sought to find their range during the first half as Robert Snodgrass sent a testing free kick just wide of David De Gea's goal in the 24th minute, while Eldin Jakupovic was forced into a low save from a Juan Mata set piece -- the first of a series of crucial stops. World-record signing Paul Pogba was well shackled by the home side's disciplined midfield, although Zlatan Ibrahimovic went close only to be flagged offside after backheeling into the side netting and David Meyler was fortunate not to be punished after raising an elbow to deflect a shot in the Hull box before Rashford's late intervention. 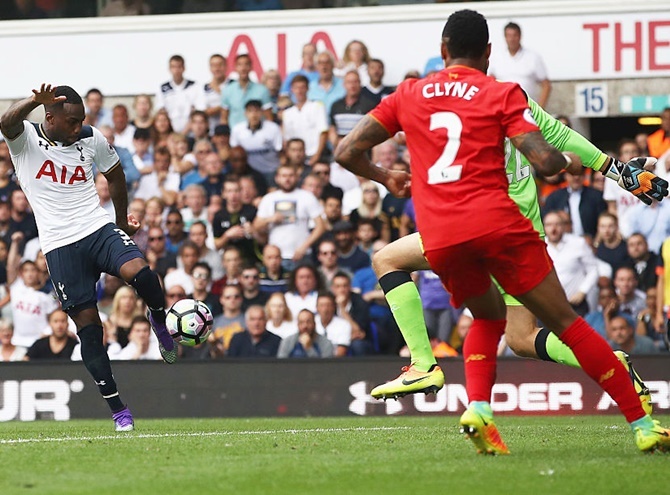 IMAGE: Danny Rose of Tottenham Hotspur scores the equaliser as the goal goes past Simon Mignolet of Liverpool during the Premier League match. Photograph: Julian Finney/Getty Images. Danny Rose scored a second-half equaliser to cancel out James Milner's penalty as Tottenham Hotspur were fortunate to come from behind to draw 1-1 with Liverpool at White Hart Lane. Erik Lamela nodded Eric Dier's cross into the path of Rose in the 72nd minute and the England left back controlled the ball and slammed it past Simon Mignolet to extend Spurs' unbeaten start to the season. Milner beat Michel Vorm from the spot in the 43rd minute after Erik Lamela had tripped Roberto Firmino in the box, as Spurs struggled to deal with Liverpool's firepower. "A draw's probably the fair result," Rose told Sky Sports. "In the first half, Vorm was our man of the match but I thought we played much better in the second." Tottenham missed the presence of suspended Mousa Dembele as Liverpool, who had been toothless in a 2-0 loss at Burnley last weekend, ran riot during the first 45 minutes. 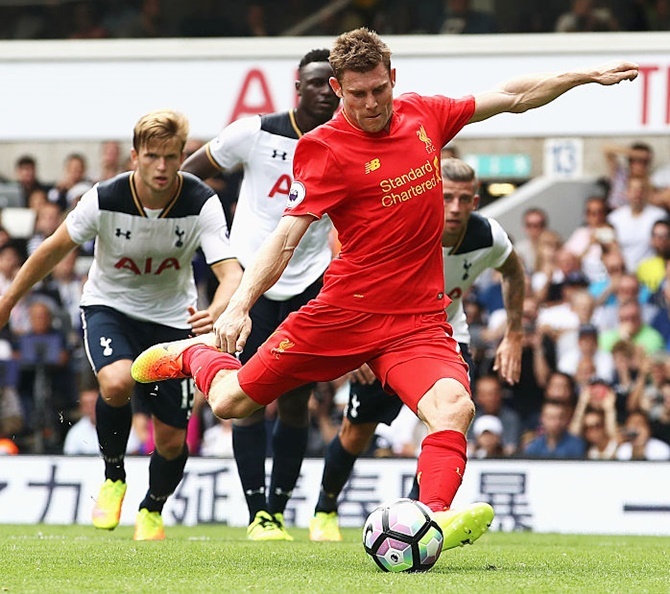 IMAGE: James Milner of Liverpool scores against Tottenham Hotspur. Photograph: Julian Finney/Getty Images. The hosts suffered a setback in the 28th minute Kyle Walker was replaced by new signing Vincent Janssen, although it was Liverpool's Mane, a 34 million euro ($38 million) signing from Southampton, who dazzled in the first half. Stand-in goalkeeper Vorm was twice called out of his area to tackle the outstanding Mane and made an excellent save to deny Philippe Coutinho from close range as the visitors created chance after chance during the first half and Spurs' resistance ended when Lamela clipped Firmino. "Philippe had a brilliant chance," Liverpool defender Dejan Lovren told Sky Sports. "I think if we went 2-0 up it's a different result. "We always want to win so we're not satisfied. We're just missing a few goals more." Tottenham started slowly last term and looked set for their first defeat of season when Mane tapped in at the back post from Adam Lallana cross, only for the effort to be ruled out for offside. Simon Mignolet produced two excellent saves to thwart Lamela and Toby Alderweireld as Spurs sought an equaliser before Rose's decisive intervention, although Harry Kane was again off the pace and his goalless start to the season continued. "Ultimately, we're disappointed," Milner said. "We didn't do enough in the second half so it was probably a fair result in the end." 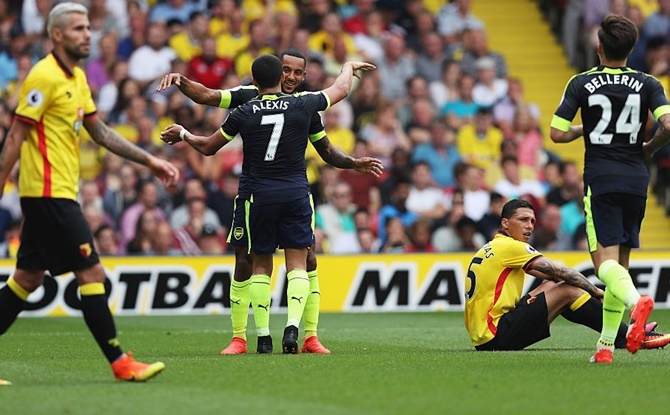 IMAGE: Alexis Sanchez of Arsenal celebrates scoring with team-mates Theo Walcott during the Premier League match against Watford. Photograph: Christopher Lee/Getty Images. A fine first half garnished by goals from Santi Cazorla, Alexis Sanchez and Mesut Ozil gave Arsenal a 3-1 win at Watford for their first Premier League victory of the season, easing the pressure on long-serving manager Arsene Wenger. Under fire from fans demanding new signings before the transfer window closes on Wednesday, Wenger was given some breathing space after Cazorla drilled in a ninth-minute penalty and Sanchez made it 2-0 in the 39th with a scrambled finish. Ozil, who pulled all the strings for the Gunners in the opening period, superbly headed home the third on the stroke of halftime after an inch-perfect cross by the lively Sanchez. Halftime substitute Roberto Pereyra pulled one back for the home side on his Premier League debut when he curled in an unstoppable shot from 15 yards in the 57th minute after a pinball-style ricohet fell kindly for him. IMAGE: Leighton Baines of Everton celebrates a own goal from Shay Given of Stoke City during the Premier League match. Photograph: Ian MacNicol/Getty Images. 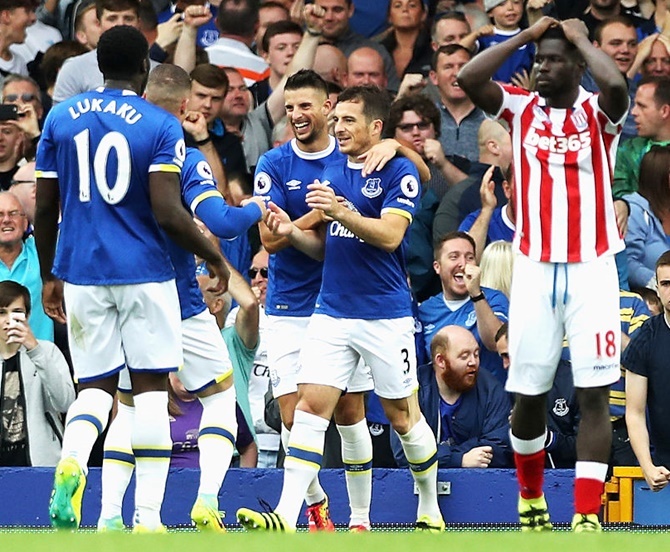 Shay Given scored a bizarre own goal as Everton beat Stoke City 1-0 at Goodison Park in an exciting game to extend the visitors' wait for a first Premier League win of the season. Given initially saved Leighton Baines's penalty after Ashley Williams fell under pressure from Phil Bardsley, only for the ball to bounce back off the post and deflect over the line off the goalkeeper's head. The home side enjoyed the best of a thrilling match and both Romelu Lukaku and Williams could have given Everton the lead during the first half, the latter denied a debut goal by Peter Crouch's goalline clearance. Stoke responded well to going behind, Marko Arnautovic going closest when his effort rattled the bar in the 58th minute. EPL: Can Mourinho's Manchester United maintain winning momentum?